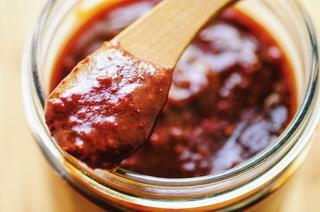 This New Mexican Style Red Chile Enchilada Sauce will become a kitchen staple in no time. This flavorful and healthy sauce is gluten-free, vegan and makes a great accompaniment to your favorite Mexican dishes! I just had to finally share this sauce recipe, as it is one of my favorite things (and something that I make quite frequently)! Having lived in the Southwest U.S. for 10+ years, I've grown quite fond of its regional cuisine. Hatch Green Chile season for instance, is one incredible beauty of living here (and something you will hear much more about come late summer!). New Mexico dried chile pods are matured (hence, red) Hatch Green Chiles! They vary in spiciness, but always have a slight smokiness that I think makes for a wonderfully flavorful sauce. I like using these chiles for the purpose of making a sauce for cheese and onion enchiladas; but please do know that it is also a great sauce for many applications -- burritos & Mexican-style rice being a few of them! For a quick, easy, ridiculously tasty sauce, that stores and freezes well, and can be used a myriad of ways -- look no further; this will not disappoint! Start by removing the seeds and stems of your dried chile pods while simultaneously rinsing under cool water.Place your rinsed chile pods in a large sauce pan with 4 cups of water.Bring to a boil, cover, reduce heat & simmer for 20 minutes, or until chile pods are soft.Using tongs, remove your chile pods (reserve cooking water) and place in a food processor or blender with your 2 garlic cloves. Blend until smooth.In a saucepan, heat oil over medium heat. Add tapioca flour & cook for 2-3 minutes until you have a nice roux.Add your blended chile paste & stir with your roux until combined well.Add 1 1/2 cups of your reserved chile cooking water. Stir well. Add salt & oregano. Stir well again.Bring to just boiling, reduce heat, and simmer your red chile sauce for 10 minutes, or until desired consistency (you can add more water if too thick, more tapioca starch if too thin! ).Turn off heat. Let cool for at least 10 minutes before using, or let cool completely before storing (fridge or freezer) in lidded glass containers for future useEnjoy!